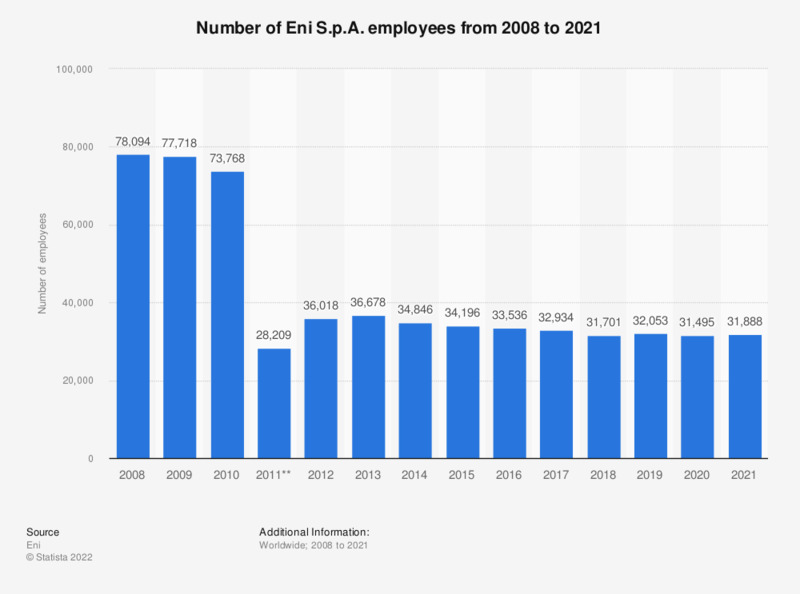 This statistic depicts Eni S.p.A.'s number of employees from 2008 to 2018. Eni is an Italian oil and gas company, and one of the largest companies in this industry worldwide. In 2018, Eni had 31,701 persons employed at period end. * Employees at period end. ** Figures from 2011 to 2014 were restated in the 2015 report to reflect the exclusion of the E&C and Chemical operating segments, which are now discontinued operations in accordance to IFRS 5. The data for 2013 and 2014 have also been restated following the new segmental reporting that the Group adopted effective January 1, 2015.